Last year I read a book that fundamentally changed the way I thought about my kids and outside play. Richard Louv's book Last Child in the Woods takes an in-depth look at the impact of nature and outside play on children, and how the time and manner in which children are outside has changed over the years. It was a fascinating read. I feel like I've always been pretty good at getting my kids outside. We're not a deep woods, hiking, spend-a-week living in a tent kind of family, but we've been known to hit a trail or stomp in a creek. No, the importance of the nature stuff I was already aware of. My lightbulb moment came when Louv described the typical playspaces in the United States today. They are ultra-safe. Not that safe playgrounds are a bad thing, per se (anyone here ever get launched off a merry-go-round at high speed?). But too often safe = boring. Many newer play spaces are actually just land developed for organized sports. Have you ever been excited to see a new park open up in town, only to realize it's a lone slide and some monkey bars surrounded by baseball and soccer fields? They're pretty much all the same. You've seen one slide/stairs/firepole combo, you've seen them all. So have your kids, and they're not impressed. This isn't to say that these kinds of playspaces are bad. There are many places in this country where any kind of dedicated playspace would be a blessing, places where there are either play deserts or unsafe playspaces. This isn't the problem in suburban Indianapolis, though. There are resources, and parks, aplenty. Since reading Louv's book, my goal has been to seek out parks and playgrounds that are different and innovative. My goal has been to get my kids excited about going to the playground again, and to see them play and stretch their imaginations in these different kinds of spaces. As fun as it is to discover these places, it's even more fun to be able to share them. That's why I'm so excited about teaming up with KaBOOM! in their Park-a-Day Summer Challenge. The fun people at KaBOOM! came up with the challenge as a way to provide families with a cost-effective method to have their kids enjoy a summer of play, while at the same time providing valuable updates to KaBOOM! 's Map of Play. Our goal this summer is to visit at least one innovative playground or park in the Indianapolis area each week. That's the beauty of the Challenge – you don't really have to go to a park every day (although I'm sure my kids wouldn't complain). Just visit as many parks and playgrounds as you can within your normal schedule and then add and/or review the playspace on KaBOOM's Map of Play. It's a win-win for everyone: the kids have a blast, and you're helping to build and update a valuable resource for families everywhere. I'll be posting my pictures to Flickr and documenting our experiences in the Park-a-Day Challenge Discussion Group. At the end of the summer I'll post our Top 5 Indy Playgrounds that won't make your kids yawn. I hope you'll consider jumping in on the challenge as well! More information, including how you can sign up for the Park-a-Day Challenge is available on the KaBOOM! website. 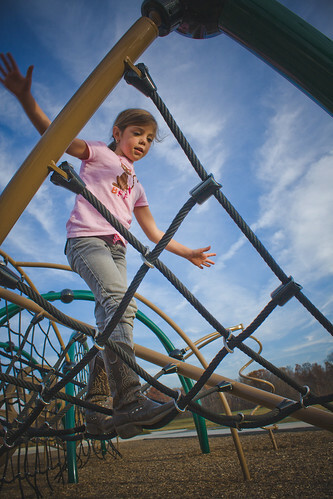 What is your favorite park or playground in your area, and why do you (or your kids) love it? If it's in Indy, we'll add it to our list of playgrounds to visit! Disclosure: This is strictly a volunteer opportunity with KaBOOM! that I've chosen to participate in and support. All thoughts and opinions are my own, and I am not being compensated by KaBOOM! for my participation. The only parks listed by me on the KaBoom site are the schools. And school playgrounds are not fun at all. Metropolis has a cool, very small shopping mall playground, for older kids (my kid would not get it at all). My favorite is Holliday Park, because of the variety of things to do and the ability to please multiple age groups. I thought that was true as well (about school playgrounds being boring), until I met with a playground rep yesterday and he pointed out the new playground at Cherry Tree Elementary in Carmel. Way cool. We’ve never been to Holliday Park! Adding it to my list. I also want to check out a park Kelly told me about, an all-wooden one near Geist? Oaklandon Park, maybe? I think it’s close to you. I am totally up for a new park a week bring it on!! I will warn you, the book can be a bit heavy to slog through at times, but there’s good stuff in there. So what’s your favorite park on your side of town? I actually saw Richard Louv speak at the IMA a few years ago and have an autographed copy of that book! I’m curious what “different” parks you’ve been to also. I had a hard time wading through kaboom to tell what was what, and was also turned off by all the school playgrounds. I’ll add Cherry Tree to my list! We’ve done Cyntheanne and loved it, but we live so close to Brooks School park it becomes the defacto choice. Better than it used to be, but still not what I’d call innovative. I do work full time, so it’s mainly a weekend thing for us, but I love trying new things. Recently went to West Park in Carmel – their “splash” park is very different than Billericay or Dillon. It’s very simple, and I thought the kids would be bored but it turned out they loved it. Who knew? I haven’t actually added many “new” playspaces to the Kaboom website, but my goal has been to improve the information in the listings that are already there. During our orientation they specifically mentioned adding traditional playspaces over school playgrounds. It’s not like you can just wander onto any school playground year round. My kids love West Park, too, but it’s a haul from Fishers. One thing I’m learning, though, is that until you get there, you can never tell which parks your kids will love and which ones will bore them. Mine seem to be especially enamored with parks that have natural elements in them (like West Park’s pond or Brook School’s creek). I’ll do a round-up at the end of the summer and let you know which ones are our favorites! What park do you have photographed in this post? It looks awesome, but don’t see the name listed anywhere. I just checked this book out at the library as well as another titled “I love dirt” that includes “activities to help you and your kids discover the wonders of nature.” The forward is by Richard Louv. I’m excited to read both books! That is Cyntheanne Park (12383 Cyntheanne Road) in Fishers. It’s one of our favorites so far! I haven’t read “I Love Dirt!” but we checked out another Jennifer Ward book, “Let’s Go Outside!” and enjoyed it. It gave me quite a few good ideas for activities throughout the year.